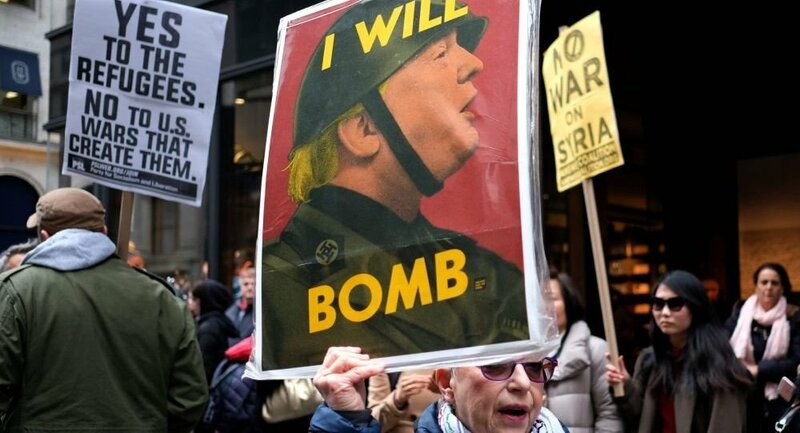 WASHINGTON (Sputnik) - Anti-war activists in the United States will hold a series of protests in dozens of cities across the country over the weekend against US President Donald Trump’s strikes on Syria, the United National Antiwar Coalition (UNAC) said in a press release. "With no legal authority and in clear violation of international law, the Trump Administration has started its criminal attack on the people of Syria with the largest US Navy task force, including US nuclear aircraft carriers and nuclear submarines, since the attack on Iraq in 2003. Trump and the Pentagon's criminal attack on Syria endangers us all," the release said after the airstrikes on Friday. "It is time for all of us to express our strong opposition to the US bombing of Syria and the endless US wars." The protests will be held in Atlanta, Dallas, Detroit and Washington DC on Saturday April 14, and on April 15 protests will take place in New York City, Oakland CA, Minneapolis, and dozens of other cities across the country, according to the statement.